Justin Hall is one third of the acting, singing, dancing Hall Brothers. Although quite young (8, 11 and 12), the brothers are making their collective mark with a dedication, focus and diverse talent skills uncommon for three young siblings. Justin, 11, is getting rave reviews for his role as Michael Banks in this critically acclaimed musical extravaganza Disney production, currently in Chicago at the Cadillac Palace Theatre. 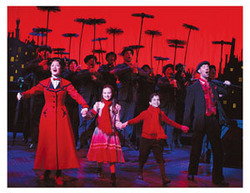 (L to R) Ashley Brown as Mary Poppins, Abigail Droeger as Jane Banks, Justin Hall as Michael Banks,Gavin Lee as Bert, and the Original National Tour Company of MARY POPPINS perform Step In Time.%u201D ©Disney/CML. Photo by Joan Marcus. Triple threat is an appropriate handle for the youthful dynamic trio known as The Hall Brothers. Spencer (8), Justin (11) and Tyler (12) are young thespians who sing and dance with a singular passion and intensity rarely found in entertainers their age. While their careers all continue to blossom, current bragging rights belong to Justin, for scoring the first national gig, in a starring role as the precocious and mischievous Michael Banks, in Disney's critically acclaimed musical extravaganza, Mary Poppins. If dedication, focus, maturity and outstanding raw talent mean anything, than surely these three brothers are destined for greatness. Despite their tender years, the Hall boys personify the very definition of entertainers, always striving for artistic excellence, creative enjoyment and the opportunity to flourish in whatever endeavor they choose to pursue. It seems incredulous that all three are still years away from having a driver's license. "I'm so impressed by Justin every day," says Ashley Brown, who stars as Mary Poppins and held the same role when it first opened on Broadway. "He has such discipline for being so young. He was off book the first day of rehearsals and took direction very well. When you rehearse a new show things are changing constantly. He was always open to new ideas and was and continues to be on his mark four shows a week." Considered one of the bright young stars of the stage, Brown feels that Justin has all the tools needed for a child actor to make it in an extremely competitive industry. "I'm always so impressed that he is in school all day and shows up for the show at night ready to work," she says. "He also has a great ear for the English accent." Justin, Tyler and Spencer have acted in countless films, videos, theatrical productions and voice overs. They're presently hard at work preparing to record and film two music videos with their vocal coach, Hannah Reimann, in New York City later this summer. Reading scripts for big budget films and commercials, auditioning for musicals and plays, recording voice over work and training with accomplished professionals speaks to the boys' talent, discipline and commitment. Finishing homework, twittering with friends, competing in extracurricular sports, and participating in community programs that benefit those less fortunate reveal an integrity, love for family and a strong desire to keep it real. When the national tour of Mary Poppins leaves Chicago for the road in July, Justin will go with it. His mother, Lane, accompanies him everywhere - it's an extremely close knit family with show business deeply rooted in their blood. The boys' grandmother, Deborah Solomon (a.k.a. Toni Gray), was featured as one of the June Taylor Dancers on the Jackie Gleason Show in the 60s. Lane was also a child performer, chosen at two years of age to star in nationally televised commercials for Vaseline Petroleum Jelly, appearing as "The Original Laughing Baby." Justin has always been tenacious and steadfast about his rapidly rising acting career. In addition to his current turn starring alongside Ashley Brown and Gavin Lee, Justin has had a handful of prominent roles, including his touching portrayal of Tiny Tim in 'A Christmas Carol". His director, Stephen Wargo, called Justin's performance "the best Tiny Tim I have ever had. He gave a consistent performance every night and has this sense of professionalism and natural ability that you can't teach." Karl Kenzler, who plays George Banks (father to Justin's Michael) in Mary Poppins, is effusive in his praise for his stage son. "Justin is a talented, sweet kid who clearly loves performing. To be chosen to play a role like Michael Banks says a lot about his ability. The kids in Mary Poppins are onstage more than anyone else in the show - including Mary and Bert. To stay focused in a play of that length is a real test of talent and maturity for a young person. And he's able to pass that test night after night." "Justin is a very hard working young actor," says Broadway veteran Gavin Lee, who stars as Bert in Mary Poppins. "His energy is always high and he has great stage presence." "The boys are incredibly focused and on their way to being super actors," says top Hollywood and New York acting coach, Diane Hardin, who has worked intensively with all three Hall brothers in musical theatre and acting workshops. "Their growth has been tremendous." Hardin should know about such things; she was Zak Efron's on-set coach for his current hit film, 'Seventeen Again', which opened nationwide in April. Some of Hardin's students over the years have included Leonardo DiCaprio, Jake Gyllenhaal, Jessica Biel, Amanda Bynes, Tobey McGuire, River Phoenix and Hilary Swank. Though they consider themselves a "team", each boy brings something uniquely special to his craft. Whether it's singing, dancing or acting, Tyler, Justin and Spencer tackle each with a passion and drive that's unusual for such young performers. In an era where many seem focused on a particular element of the business, the Hall Brothers are a throwback to the days of the multi-talented performer. The Hall Brothers' first music videos as a group will be recorded and filmed this summer. They're ecstatic to have the opportunity to work side by side with one another as siblings, harnessing their talents individually into dynamic and memorable three-part harmony. This project promises to resonate strongly with their fans and impart a discernible buzz within the industry as a whole. The song, "I Have a Dream", was written by Reimann who was so taken with the boys and their abilities that she performed with them at a special concert held at Steinway Hall last December in New York City. Recording this original song along with a second inspirational piece, 'When I Close My Eyes", and setting them both to film will mark a new chapter in their careers. "These boys are an amazing combination of talent, intelligence, professionalism and drive," says Reimann. "Plus, they have the beauty and innocence of being children." The boys' dance instructor, Lance Theobald, of the Great Neck Arts Center, is equally enthusiastic in his praise for how good the three Hall brothers are and how quickly they learn. "I have worked with a lot of kids and know when they have that special something," says Theobald. "And these kids have it! They have all the ingredients for success: discipline, talent and a mother who believes in them. It's the full equation and the sky is the limit!"